What in the Wide, Wide World of Sports? : It's the Rut! Holla! Brick City, NJ- Lost in the furvor of the Don Imus incident comes news from Rutgers that nobody was expecting. It seems that one of the so called "Nappy-Headed Hos," Rashidat Junaid, bears a striking resemblance to rapper and hip-hop mogul Jay-Z. When questioned about these allegations, head coach C. Vivian Stringer said: "We don't look at our players as Jay-Z or black or nappy-headed. It's about us as a people. When there is not equality for all, or when there has been denied equality for one, there has been denied equality for all." The unsuspecting media then got to C. Vivian Stringer continue her full-court press. Apparently this was the 59 year-old black woman's first brush with prejudice. 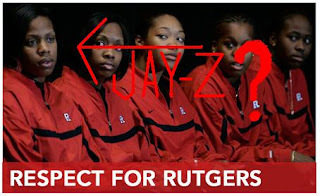 "While they (Rutgers players) worked hard in the classroom and accomplished so much... we had to experience racist and sexist remarks that are abominable, contemptible, deplorable, despicable, ignoble, pitiful, regrettable, and unconscionable..."
After Stringer finished her "I Have a Dream..." speech, Rashidat Junaid approached the podium to address the claim made against her: "I may resemble Jay-Z. My face might look like his face. But I am not Jay-Z. I am Rashidat Junaid, and if you think I look like Jay-Z...well, I can't change that. Your ignorance cannot hurt me. I am Rashidat, and nothing you say will make me anything else." What Took Place in Space?